(Not so) Wordless Wednesday - Tom's 1st day at Nursery! I can't leave this wordless.... It's too special a day! Today is Tom's first day at "big" nursery! 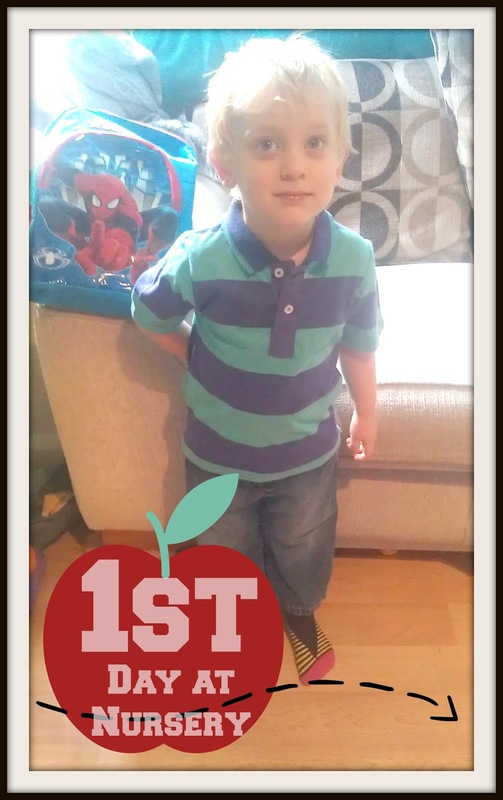 He spent a few months doing one day a week at Applebossom in the last school year, but now he's moved up to Appletree which is the proper 16hrs per week nursery. He was a little nervous, but his key worker came to visit yesterday. He has the same lady that Jack had when he was there so that's nice already. She had a lovely chat with him, and he showed her his Squishy toy, his pony collection, and the games he likes to play on my iPad. When she said she had some ponies he could play with today he warmed up no end! Today me and Jack walked him to his class, put his stuff away, and and Jack talked to him about the class - which made him feel very special and grown up too. Luckily when he was at Appleblossom he got to have his lunch in the Appletree room so he knew the place well enough, knew where the toilet was, where the toys are and so on. That made him feel at home straight away. I expected him to have a bit of a meltdown when we left, but he didn't. He was on the hunt for some of the bead toys he'd seen in reception and when there were none in the class his key worked offered to go and get the one he'd seen on his way in. He followed her out and carried it back to class himself. At this point I said bye bye and he cheerily called "Byeee" back. He's such a different child to who he was a year ago, or even just 6 months ago! Wednesday is his short day. He'll be having lunch about now, and in 15mins or so I'll get Georgie ready to go out and we'll go and fetch him. I think he's going to have had a lovely time! I hope he brings some nice things home with him. He loves to draw and paint!